‘There Will Never Be Another You’ is written in the key of Eb Major and follows a standard A-B1-A -B2 form. The melody of the tune is very memorable as it contains a sequence of two virtually identical phrases, but the second one is played a major third higher diatonically. So basically that means that the intervals are the same, you just move the melody line up a major third in the key of Eb Major. The tune contains a lot of step wise motion melodically which lends itself well to block chord harmonisation. Check out the introduction lesson on block chords before watching this lesson as that will give you some insight into the construction of these types of voicings. 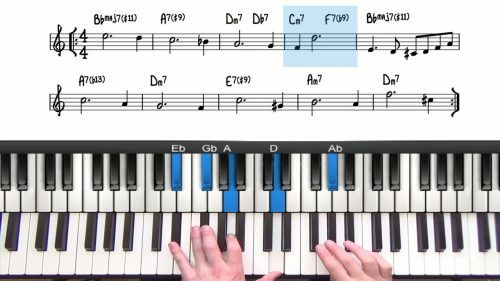 We’re going start off by playing through the tune very freely in a rubato manner and then the second time through we will firmly establish the rhythm and timing and harmonise the main melodic phrases with block chords. 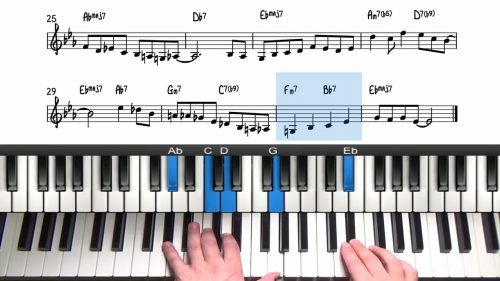 In this lesson we will explore how you can develop your ability to add fills and other melodic decoration to the tunes you are playing. If you're looking for a tune to practice the 4 way close and drop 2 harmony, this is it! The melody moves in steps throughout making it a perfect candidate for block chord harmonisation. 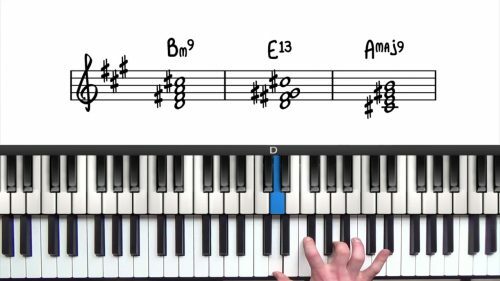 Check out the transcription exercise lesson on this tune where we analyse an improvised solo over the chord changes.